in Writer you'll get two different toolbar icons in 4.1.5 and 4.1.6. > This is not necessarily a bug, but I'd like to check on this: on Linux-64 (I haven't tried on other systems), if you are editing a file in Writer you'll get two different toolbar icons in 4.1.5 and 4.1.6. > Was this done on purpose? I believe the old ones are more informative, as it usually happens to have, say, a Writer and a Calc document open at the same time. > If your system does not come with a bottom toolbar, you will still notice the difference in the top toolbar by switching between the two instances. > On the other hand, the new high-resolution icons look really nice, as I already noted. Are you talking about the desktop panel? I use Xubuntu (18.10 on 64bit) and I do see the Writer/Calc/... icons, not the orb. > and I do see the Writer/Calc/... icons, not the orb. 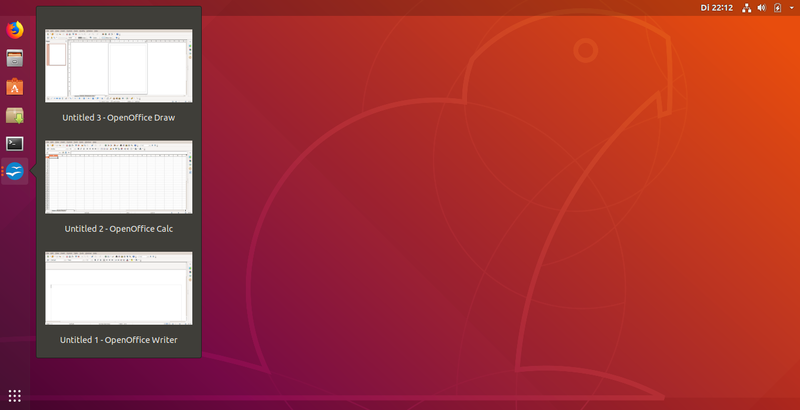 associated with the window in GNOME (so Xubuntu may be different). Release Notes as a minor UI change. > in Writer you'll get two different toolbar icons in 4.1.5 and 4.1.6. Do you have by any chance something like "icon grouping" enabled? >> Are you talking about the desktop panel? I use Xubuntu (18.10 on 64bit) and I do see the Writer/Calc/... icons, not the orb. > I see the difference more or less in every context where an icon is associated with the window in GNOME (so Xubuntu may be different). > - in the Alt-Tab dialog to switch windows see https://imgur.com/a/EM3yTpU where both 4.1.6 and 4.1.5 were open on an empty Writer document. > This is not a bug, even though one might want to mention it in the Release Notes as a minor UI change. - Each application icon in the desktop panel, side by side, with no orb. So there was no change with XFCE.